This pin is part of a set of 12 Pins, each commemorating the 50th Anniversary of Walt Disney Imagineering (WDI) and each celebrating one of the eleven Theme Parks designed and built by the Company and the Disney Cruise Line. 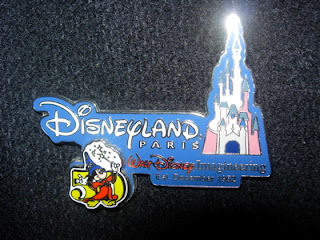 This pin specifically celebrates Disneyland Paris. Of course, Disneyland in California was the first Theme Park that WDI built ( and the first Theme Park ANYONE ever built). Originally called WED Enterprises (for Walter Elias Disney) and wholly-owned by Walt Disney when it began, Walt Disney Imagineering was renamed in 1986 shortly after Walt Disney Productions (the Corporation) was renamed The Walt Disney Company.